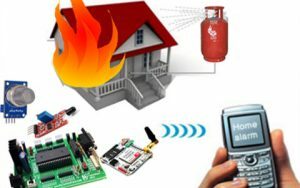 In this article, we are going to give a brief explanation on how to implement “Home and Industry Safety using Fire and Gas Detection System using GSM”. The main aim of this project is to monitor for liquid petroleum gas (LPG) leakage to avoid fire accidents, providing house/industry safety feature where the security has been an important issue. 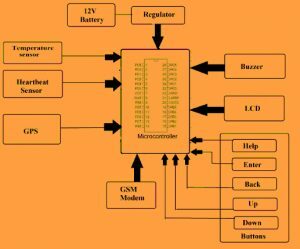 The system detects the LPG leakage using a gas sensor and flames by a flame sensor that alerts the consumer about the gas leakage by sending SMS with the help of GSM module which is connected preprogrammed microcontroller. Heart attack (coronary artery disease) is one of the most common and very serious effects of aging. The cholesterol, fatty deposits, emotional stress, and drug intake lead to build spasm in blood vessel walls. As the spasm grows, less blood can flow through the arteries. As a result, the heart muscle can’t get the blood or oxygen what exactly, it needs. This can lead to a heart attack. In this article, We are developing a system which will help to decrease the death rate due to the heart attack by early heart attack detection. In our system, we will be using smart Heart Beat sensor which is easily available in the market. Nowadays, the security system of the nation depending upon the enemy’s war and so the security of the soldiers is considered as an important role in it. Concerning the safety of the soldiers, there are numerous tools to observe the health condition as well as bullets on the soldiers. In soldiers security, biosensor system gives different kinds of sensors like small physiological, Barometric and Oxygen analyzer, processing capabilities and transmission modules, and can thus enable low-cost wearable unremarkable solutions for health monitoring system. The proposed system uses GPS to track the direction of the soldier in the form of latitude and longitude values. So that direction can be found easily. Designing of this system using GPS and GSM gives a wireless system for tracking the location of the soldier and observing the heart beat rate and body temperature of the soldier. The biomedical sensors used in the proposed system are sensor and beat. The temperature sensor is used to measure the temperature of the body as well as heart beat sensor is used to measure the heartbeat rate of the soldier. Soldier unit is placed on the soldier. This unit has four parts, namely biomedical sensor, keypad, GSM, and GPS. The Heart Beat sensor gives an easy way to study the function of the heart This sensor is used to monitor the blood through a finger. As the heart services blood through the blood vessels in the finger, the blood amount in the finger changes with respect to time. 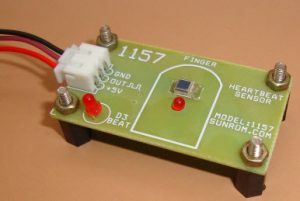 Heartbeat sensor shines a light lobe through the finger to measure the light communicated to the LDR.The signal gained from the LDR is changed by the amplifier and will be cleaned and provided to the ADC. 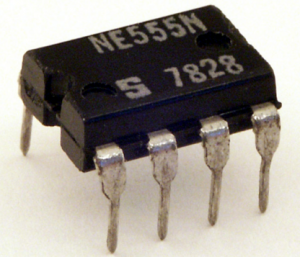 The Temperature sensor can be sensed with the help of the LM35 sensor. 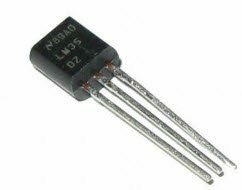 This series is accurate integrated circuit sensors, whose o/p voltage is linearly related to the Celsius temperature. A Station, which is pressed directly will aware Base station and thus will not delay for heart beats to go out of the normal range. 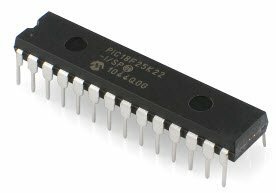 The term PIC stands for “Programmable Interface Controller”, these are standard with both industrial developers and also hobbyists similar due to their wide availability, low cost, large user base, a wide collection of application notes, and available at low cost. 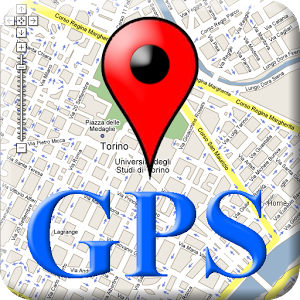 The term GPS stands for Global Positioning System (GPS) is a space-based global navigation satellite system that offers consistent location and information about the time in all weather conditions from anywhere on the Earth when and where there is a free line of sight to four (or) more GPS satellites. 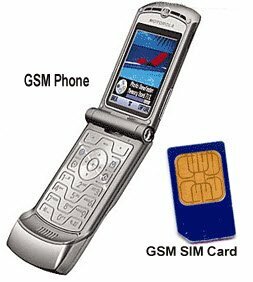 The term GSM stands for “Global System for Mobile communications”, controls as the world’s most extensively used cell phone technology. Cell phones use a GSM n/w by searching for cell phone towers in the near area. The LCD display is used to display the temperature and heart beat rate, current time, date and the position of the soldier. The environmental analyzer is used to find the situation of an environment such as the oxygen level and atmosphere pressure and also observe the real-time video of the soldier’s unit. A webcam is a device used to capture a video that is connected to a PC or computer n/w, frequently using a USB port, Wi-Fi or Ethernet, or build in for particular types of laptops. The keypad is a part of Human Machine Interface and plays a vital role in a tiny embedded system where human interaction is required. Matrix keypads are very simple in their architecture and also very simple of interfacing with any microcontroller. From the above information(health monitoring system) we can conclude that it would help in tracking the health status of the soldier with measures of heart beats and also the temperature of the body. It would also assist in tracking his location by using GPS and GSM modem. It can send all information to the BSS (base station) so that more necessary action could be taken. Furthermore, any doubts regarding this concept or to implement any electrical and electronic projects, please give your valuable suggestions by commenting in the comment section below. Here is a question for you, What are the applications of health monitoring system ? 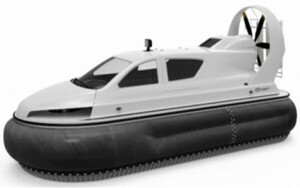 The first practical design of the hovercraft was resulting from British invention from 1950 to 1960. The RC Hovercraft are used throughout the world as a specialized transport in disaster relief, coast guard, military, and in passenger service. These vehicles are supported in various ways, some of them are specially designed wings. The hovercraft is a vehicle that can drive like a car, flies like a plane, it can move on the water & land surface and float like a boat. Hovercrafts are the hybrid vehicles operated by a pilot. In this, we will discuss RC Hovercraft by an android. Electricity is an essential requirement for leading a happy life. It is to be correctly used and achieved. Many statistical errors overcome in the process of monthly customer billing. This idea of wireless data transmission is being planned to decrease the human involvement to gather the monthly reading and to minimize the technical problems about the billing process. This will help in a huge reduction of power thefts as well to analyze average power consumption of a certain locality. An automatic meter reading system is an actual way of data collection, that permit substantial saving through the saving of meter read, more accuracy, allow regular reading, better billing, condensed tempering. It gives better customer services, by transferring alert of power cuts and updates. 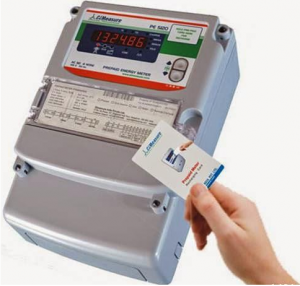 Automatic meter reading (AMR) technology is used for remote monitoring, control domestic energy meter and also to reduce the power thievery. 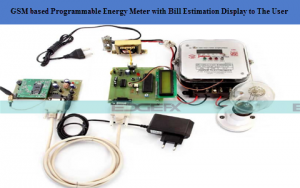 This article presents a programmable energy meter using GSM technology, that enables energy Supplier companies to read the energy meter reading frequently without the person visiting each house. This project is very beneficial for small villages or remote area. This system can be very efficient, swift and accurate. 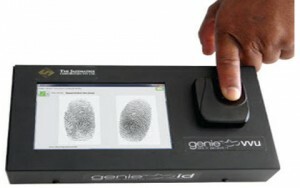 The biometric is a technology of measuring, science and it analyze the biological data. In the modern communications approximately it has accessible electronically, users of computer technology, it has increment in electronic services and with the security system. It improves in the election system with the help of new technologies in voting process. The information about election data is stored, recorded and processed the above information as a digital information. In olden days the information security is with the help of military and instructions of the government. The human body characteristic like DNA, fingerprints, voice patterns and hand measurements is used for authentication purpose. The e-services and information security are making sure that data, communication, have the security and privacy enable. The electricity theft has appeared as a major problem in power divisions in particular in the expanding countries. A vast amount of income is lost due to this theft. In some nations this is so strict that governments are acquiring losses instead of income. In some cases government has to supply subsidies to the power division to keep a reasonable price of power. The economic loss results in lack of funds for savings to develop the existing capacity of electricity. As a result government has not succeeded to assure the ever rising demand of electricity. Robbery electricity, avoiding a meter, billing wrongdoings and not paid bills. Billing irregularity comprises wrong meter reading taken by bribed service man. Different technical and non technical techniques were projected in the past to notice electricity stealing. Some of the technical methods to identify pilferage are utilize of central observer meter on harmonic generator, secondary terminals of distribution transformer, extreme learning machine, genetic support vector machines & a power line impedance technique. In general, controlling of the home appliances can be done by normal switches. But, these days we frequently see the home automation for controlling the appliances using several technologies. 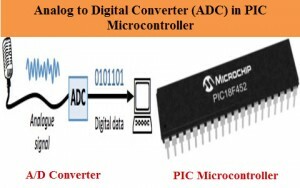 This article presents the DTMF based load control system. DTMF is a signaling system for recognizing the inputs on a keypad. It is used in signaling for telecommunication over analog telephone lines in the voice frequency band among telephone handsets and communication devices. 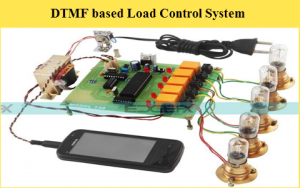 This Article discusses about DTMF based load control system.